Pasternak lived through the war with everyone together and even partly in concert with the Party line, trying to convince himself of the oneness of Russian and Soviet, assuming they were understood in some higher sense. Only when absolute evil — fascism — had been done away with did Pasternak tackle relative evil, clearly not wishing to ascend to his ideal mission through tragedy. Boris Pasternak, the writer and poet who died half a century ago, was born to an artist (Leonid Pasternak) and a pianist (née Rozalia Kaufman). Perhaps because the company of cultural eminences was as natural for him as that of sheep and geese is for a country boy Pasternak found the romantic division of the world into high and low alien. He, on the contrary, wanted to work with everyone together, with ordinary people, for art and, therefore, artificiality were the daily fare of his childhood. Pasternak’s own romanticism was not rejecting, but including. Years would have to go by before Pasternak began to have doubts about the happiness of hundreds of thousands and even millions of Soviet citizens. On the first day of 1936 he printed his famous poem in which he found a lofty image even for Stalin — the genius of action: “But nowadays at a distance/ Behind an ancient stone wall/ Lives not a man, but a deed/ An action the size of the globe.” Pasternak seriously believed that those two extremely different principles — the potentate and the poet — had knowledge of one another. However, in 1937, when he was requested to sign an appeal to wipe off the face of the earth Red Army commanders (including Marshal Tukhachevsky) accused of treason, Pasternak saw no lofty meaning and flatly refused while his pregnant wife threw herself at his feet and begged him not to destroy their future child. Subsequently a legend arose that Stalin had personally crossed Pasternak’s name off a list of people to be shot, saying: “Don’t touch that celestial being” (or, in another version, “holy fool”). 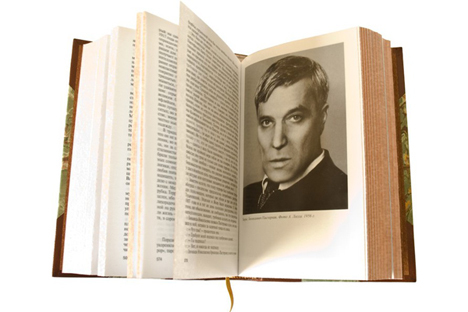 Pasternak had long dreamed of a book that would be only “a piece of his smoking conscience”, and this time his smoking conscience instructed him to tell the world the bitter truth about something he knew absolutely nothing about — about the First World War and the Russian Civil War that he had failed to notice. Here his tendency to search for symbolic meaning in everything ruined his prose but gained him worldwide renown. Symbolism rarely goes well with verisimilitude, and Pasternak had never been a master of the realistic portrait to begin with. How can one believe a doctor who never even mentions his risk-filled work! If Pasternak had openly assigned the half-dead silhouettes in Doctor Zhivago allegorical names (Russian Femininity, Russian Intellectual, Fanatic, Cynic, etc. ), that at least would have been honest. But the obtuseness of the Soviet regime removed him from the zone of aesthetic criticism and made him an ideal candidate for the Nobel Prize — both noble and persecuted. Especially since in translation it wasn’t so noticeable that the educated characters spoke in the language of philosophers while the common people were such caricatures as to make one blush. On the screen Doctor Zhivago came off like War and Peace: the same passion against a background of historical storms, the same Russian exoticism with an Asian flavor: the snub-nosed doctor is played by Omar Sharif, the soldiers are all drowning in their outsize Cossack hats. Mass culture seized on the novel’s melodramatic potential, even going so far as to turn it into a musical. Pasternak didn’t live to witness that triumph. He saw the Soviet newspaper campaign against him (which forced him to refuse the Nobel) as his Golgotha, but now his game of one-upmanship brought him no comfort of grandeur. Playing a game of one-upmanship with a tyranny turned out to be easier than with the rabble: that game drove him to his grave.